A team representing OFFALY took part in the 2017 Go for Life Games held in the DCU on Saturday, 10th June. They were one of twenty four from around the country participating in a day of fun sporting activities. With 24 teams from 21 counties competing OFFALY faced some stiff competition on the day. 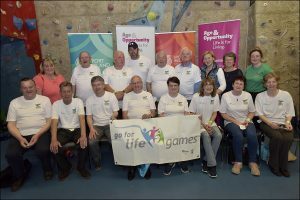 The games themselves are devised specifically for Go for Life. ‘Lobbers‘ is a target game adapted from petanque and boules; ‘Scidils’ is a two-sided adaptation of ten pin bowling but using two skittles; ‘Flisk‘ is adapted from boccia and horseshoe pitching. These games, with clear rules and scoring systems, can be played and practiced by everyone, no matter what level of sporting ability. They are great for developing balance, flexibility and concentration. The social aspect of the Games also brings people together for fun social events with a healthy amount of competition to keep things interesting. To find out more about Go for Life in County OFFALY , contact Age & Opportunity on (01) 805 7738 or visit ageandopportunity.ie. Go for Life is the national programme for sport and physical activity for older people. Go for Life is an Age & Opportunity programme, funded by Sport Ireland. Age & Opportunity aims to contribute to changes in attitudes and practices in relation to ageing and older people in Ireland such that as people age they can develop their full potential on three levels – the personal, the societal and the civic – to the extent that each individual chooses. This is informed by international public policy initiatives as well as research showing that participating in society is good for individual health and well-being, and good for communities through the building of social capital. Fundamentally it is also informed by the conviction that full citizenship is the right of everyone no matter what their age or background.